Long Island and Cape Cod are under blizzard warnings. New York and Philadelphia may be in for their coldest temperatures in years. And in Crane Lake, Minn., the mercury dipped to a brisk minus 42 degrees. Oh wait—no it didn’t. Mercury freezes at minus 38 degrees. At least those facing miserable weather today can take comfort in the knowledge that they have plenty of company. According to USA Today, 100 million Americans were under some sort of winter storm watch, warning, or advisory this morning. 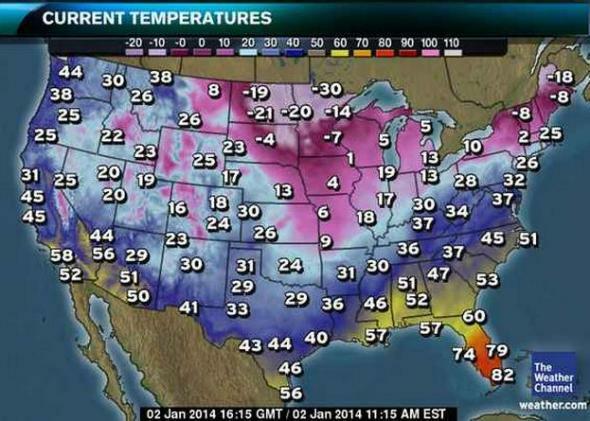 The national weather map (above) is enough to make the whole country hate Florida. And FlightAware’s “Misery Map,” below, is enough to make the whole country hate air travel. As Eric Holthaus points out, more than one-half of all flights from New York, Chicago, and Boston are now delayed or canceled. Boston’s Logan Airport, in fact, is now slated to shut down entirely at 8:30 p.m., with flights resuming at noon on Friday, weather permitting. All of which could only mean one thing: Global warming is false! Oh, except in Australia, where temperatures in some places topped 120 degrees today, nearing 53-year highs and prompting extreme fire warnings.